Under the stewardship of Doosan Group Chairman Park Jeong-won, Doosan Infracore and Doosan Bobcat, subsidiaries of Doosan Group, are on a roll on the back of the recovery of the construction industry in the United States and China. The success of the two companies is owed to Chairman Park’s “guts management” in which he pushed strategies such as the developing of products tailored to meet local needs, despite the sagging construction industry caused by the impacts of a global financial crisis. In a consolidated financial statement announced on Oct. 30, Doosan Infracore posted 191.5 billion won in the third quarter of 2018, a 33 percent jump over the same period of last year. The accumulative operating profit swelled to 706.1 billion won in the first nine months of this year, surpassing 660.8 billion won in operating profit for the whole of last year. Doosan Infracore’s run in China, the world’s largest excavator market, led the good Q3 2018 business performance. The company sold 12,264 excavator units in the first nine months of the year, a 55.6 percent surge from 7,881 units during the same period of the previous year. On back of its booming sales in China, Doosan Infracore is predicted to chalk up 7.8 trillion won in the whole of 2018, 20 percent more than last year, business sources said. It represents the best-ever business performance since 2005 when the company joined Doosan and since 1937 when Chosun Machinery Manufacturing, initial predecessor of Doosan Infracore, was established. The Chinese construction machinery market began to cool down in 2012. In 2011, 170,000 excavator units were sold, but the number shrank to 50,000 units in 2015. Despite the minus growth, Doosan Infracore braced for the recovery of the market by coming up with strategies to strengthen its competitive edge, including the development of products tailored to satisfy local needs. The Chinese construction machinery market, which was caught in a recession, began to improve last year. The recovery of the market is attributable to a rise in demand for construction machineries riding on Chinese President Xi Jinping’s mega “One Belt One Road” project and the development of mines, coupled with surging of raw material prices. Doosan Infracore released “DX-9C Series” that has fuel efficiency improved by over 15 percent compared to the conventional models and the supersize 80-ton class mine excavator models. Such models tailored to meet local needs led an improvement in sales in China. Doosan Group Chairman Park toured Doosan Infracore’s plant in Yantai, China. At that time, he urged his executives and staff to secure a stable profit-taking position by strengthening competitiveness when the company fared well. 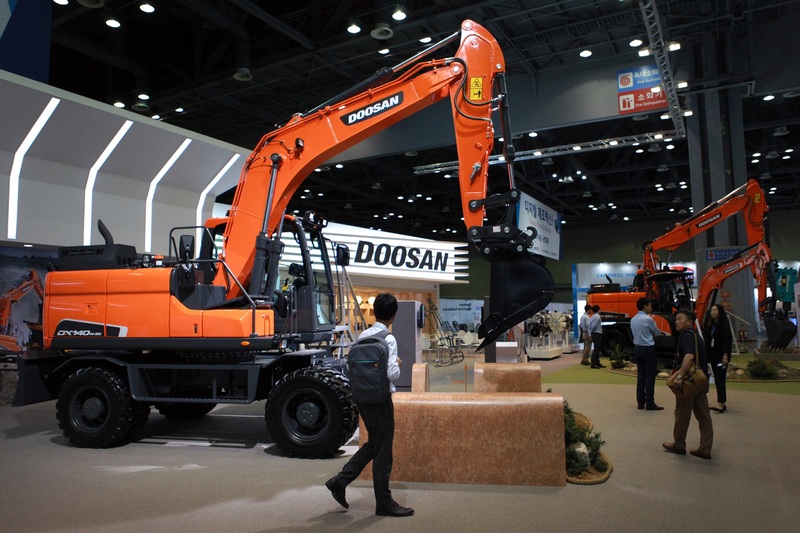 Doosan Bobcat, a small-size construction equipment maker, also logged 122.9 billion won in operating profit in the Q3 2018, a 45.4 percent jump over the same period of last year. The good business performance was owed to a surge in demand for small-size construction equipment, including excavators and loaders, riding on U.S. President Donald Trump’s policy of infrastructure investment and the recovery of the construction industry. The company saw sales in North America and Oceania surge 32.4 percent compared to the previous year.